Originally written in response to requests from knowledge-thirsty clients and dowsing students, DOWSING – The Ultimate Guide for the 21st Century swiftly evolved into something much more: a mainstream book that brings the undoubted benefits of this ancient art to the 21st century, and makes dowsing, and its unlimited applications, accessible and relevant for all. how you can start dowsing now … and how dowsing can be your ultimate guide to successfully navigating the 21st century. I couldn’t put it down so read the whole thing in one sitting – well-written, thoroughly interesting and informative from cover to cover. If you are already a dowser, you’ll love it. If you are not, be prepared to have your eyes opened. David Hamilton, PhD, author of It’s the Thought that Counts. 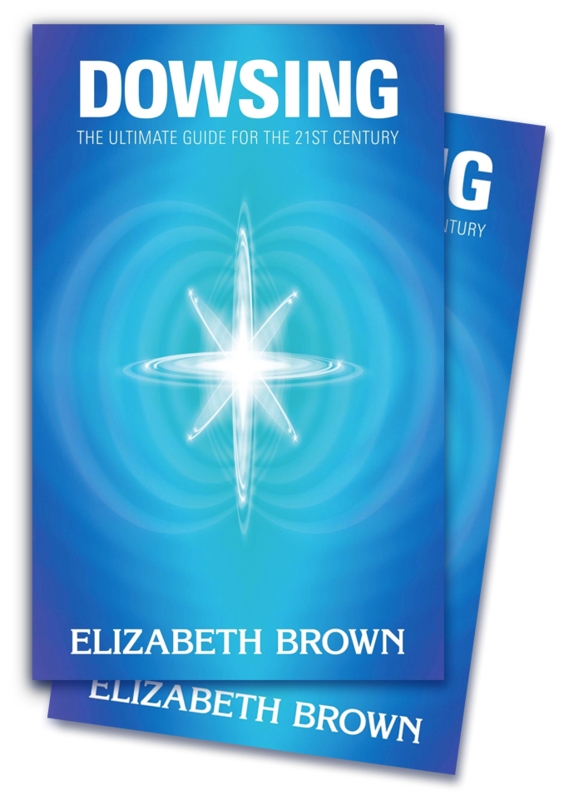 Elizabeth Brown’s DOWSING – The Ultimate Guide for the 21st Century has to be just about the best description of the faculty of dowsing, consciousness, healing and intuition currently available. It’s also carefully researched and thoughtfully written – a ‘must have’ book. At this pivotal time in the evolution of human consciousness, many people are discovering and developing their intuitive abilities. If you are, too, you’ll find this book invaluable. Elizabeth Brown has set the standard with her book DOWSING – The Ultimate Guide for the 21st Century, which unequivocally brings dowsing theory bang up to date with current scientific thinking about quantum entanglement, information theory, and how consciousness affects outcome. Brown has long experience of the subject and writes clearly and engagingly… She occupies the terrain where the spirituality end of parapsychology meets the New Age, with much talk of tapping into a quantum field of information and Akashic records, the sort of book which is happy to mingle Max Planck, Dean Radin and Deepak Chopra. This book is an amazing piece of work and inspiration on the philosophy of the mechanics of the energetic universe. If you truly wish to make significant and long last changes to issues in life, then I would recommend this book to beginners as well as advanced practitioners in dowsing and other healing modalities. The ancient art of dowsing is given a 21st-century treatment by Elizabeth Brown in her no nonsense guidebook for practitioners and novices alike … inspirational. Reading this book is inspiring… once read it will surely become a valuable reference that you will return to again and again. Thank you Elizabeth for having the desire, tenacity, courage and thoughtfulness to put your research, knowledge, insights and passion into this volume for us all to gainfully share. What a splendid book! Stimulating and instructive, it opens up new areas of thought. Insightful, witty and inspiring, the dowsing world owes Elizabeth a great debt for writing this book – it is, simply put, groundbreaking. What a profound effect your book has had on me and my dowsing. It has really struck a chord, reinforcing many of my own personally held beliefs on the way in which dowsing itself works and the way in which we access information. Congratulations – it really is great to read a book that is centred, measured, and something I feel that the entire dowsing community should be proud of! I have read many books on dowsing, but few approach this one in terms of comprehensiveness, clarity and wisdom.